I have some affection for these odd fossils, the conulariids. When I was a student in the Invertebrate Paleontology course taught Dr. Richard Osgood, Jr., I did my research paper on them. I had recently found a specimen in the nearby Lodi City Park that was so different from anything I had seen that I wanted to know much more. I championed the then controversial idea that they were extinct scyphozoans (a type of cnidarian including most of what we call today the jellyfish). That is now the most popular placement for these creatures today, although I arrived at the same place mostly by luck and naïveté. The specimen above is Paraconularia newberryi (Winchell) found somewhere in Indiana and added to the Wooster fossil collections before 1974. A close view (below) shows the characteristic ridges with a central seam on each side. Conulariids range from the Ediacaran (about 550 million years ago) to the Late Triassic (about 200 million years ago). They survived three major extinctions (end-Ordovician, Late Devonian, end-Permian), which is remarkable considering the company they kept in their shallow marine environments suffered greatly. Why they went extinct in the Triassic is a mystery. The primary oddity about conulariids is their four-fold symmetry. They had four flat sides that came together something like an inverted and extended pyramid. The wide end was opened like an aperture, although sometimes closed by four flaps. Preservation of some soft tissues shows that tentacles extended from this opening. Their exoskeleton was made of a leathery periderm with phosphatic strengthening rods rather than the typical calcite or aragonite. (Some even preserve a kind of pearl in their interiors.) Conulariids may have spent at least part of their life cycle attached to a substrate as shown below, and maybe also later as free-swimming jellyfish-like forms. It is the four-fold symmetry and preservation of tentacles that most paleontologists see as supporting the case for a scyphozoan placement of the conulariids. Debates continue, though, with some seeing them as belonging to a separate phylum unrelated to any cnidarians. This is what’s fun about extinct and unusual animals — so much room for speculative conversations! Driscoll, E.G. 1963. Paraconularia newberryi (Winchell) and other Lower Mississippian conulariids from Michigan, Ohio, Indiana, and Iowa. 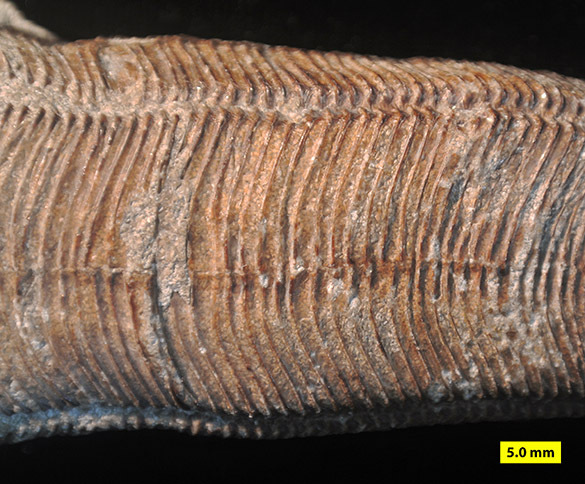 Contributions from the Museum of Palaeontology, The University of Michigan 18: 33-46. Hughes, N.C., Gunderson, G.D. and Weedon, M.J. 2000. Late Cambrian conulariids from Wisconsin and Minnesota. Journal of Paleontology 74: 828-838. Sendino, C., Zagorsek, K. and Taylor, P.D. 2012. 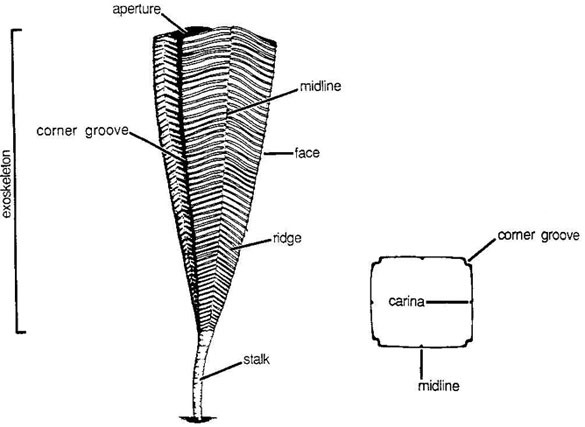 Asymmetry in an Ordovician conulariid cnidarian. Lethaia, 45: 423-431. Van Iten, H.T., Simoes, M.G., Marques, A.C. and Collins, A.G. 2006. Reassessment of the phylogenetic position of conulariids (?Vendian–Triassic) within the subphylum Medusozoa (Phylum Cnidaria). Journal of Systematic Palaeontology 4, 109–118.